Buying Land for a House...Avoid Surprises- Armchair Builder :: Blog :: Build, renovate, & repair your own home. Save money as an owner builder. So you’re buying land for a house. As with any home you might buy, you want to make sure there are no surprises that could cost you extra money. One item you will want to investigate prior to purchase is the subsurface soil conditions. If there is rock hidden under the ground, your construction costs could go up by tens of thousands of dollars. So how do you investigate below the surface conditions before buying land for a house? Ask the city building department, property owner or the developer of the property if any test borings have been performed on the site. A test boring is performed with a special machine that drills down 8-10 feet and takes a sample of soil. The soil is analyzed to determine it’s characteristics. Most newer communities have had test borings completed prior to developing to help engineers and planners create the best design. The soil test also tells potential developers what the costs will be to install infrastructure like roads, sewers, and water lines. The developer of the property should also be able to tell you what they encountered when putting in the water and sewer lines. 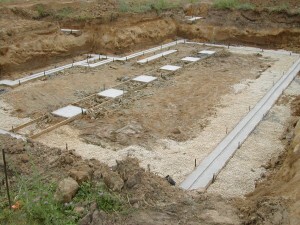 There are several other soil conditions that can create problems on your new building project. Soil borings will help identify these issues prior to purchasing your land or lot to build on. If no soil borings have been done, you may want to hire a geotechnical engineer (a.k.a. soils engineer) to review the location of your property and give you a professional opinion as to what might lie below the surface. Many communities have soil maps that will allow your engineer to provide an opinion as to whether you will encounter any problems. If you want to know for sure what you are dealing with, you can pay your engineer to do test borings prior to buying land for a house. This will cost you several thousand dollars but can prevent huge cost overages. You may also want to ask neighbors in the immediate area if they built their home and if so, what the conditions below the surface were like. There is no guarantee the house next door has the same soil type, but if they did have rock, your chances 0f seeing rock on your property go up. I like this method of investigation as it doesn’t cost you anything. One other method to check for rock before buying land for a house…dig some test holes. If you have a friend with a back hoe or other digging equipment, you may want to ask the owner of the property you are interested in if you can dig a test hole or two to check for rock. Make sure you call for a utility locate prior to digging…the last thing you need is to hit a power line or gas line. You may want to add a clause into your contract when buying land for a house to protect yourself from the costs associated with rock or unsuitable bearing soil. This clause would require the seller to reimburse you if abnormal costs for excavation or foundation are required due to the subsurface conditions. You will probably want to speak with an attorney to iron out the details. I have seen these agreements added on many land purchases. It depends how understanding the seller is…and how bad they want to sell. If rock is encountered at or above your footing level, you will incur additional costs for removal. 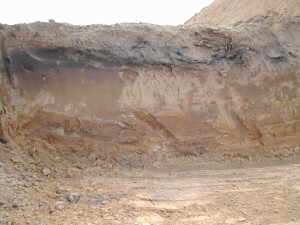 Removal is typically accomplished with either a hydraulic rock hammer as shown in the picture above or with blasting. On most occasions, if there are homes nearby, your only option will be to chip away at the rock with the rock hammer. This can get very expensive as the machine and operator can cost over a thousand dollars per day. Don’t forget, you need to remove the rock where the foundation sits and also where utilities are run. Utilities include your water and sewer main lines, and electric, cable, and gas services. Any rock that is removed from the excavation needs to be hauled away, crushed or used in some way on site. This can also add a tremendous amount of money to the cost to build your new owner-built home. By doing some investigating prior to buying land for a house, you will most likely save yourself some major headaches and costs on your new building project. Have you ever thought about building your own home? Be sure to stop by the Armchair Builder How to Build Your Own Home resource page.